Friedemann Friese has become one of the most prolific (and eccentric) game designers alive today. Luckily for us, his games, whose German titles always start with the letter 'F', tend to be extremely good designs and have become some of my favourites - Power Grid (Funkenschlag), Black Friday (Freitag), and Famiglia are just a few. Well, a couple years ago Friese made a trivia game Fauna about betting on facts about animals, specifically on where they live and how big they are. 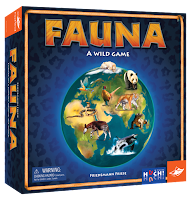 Like Wits & Wagers before, in Fauna you can win without knowing the exact answers but scoring for playing strategically and guessing close to the answer. 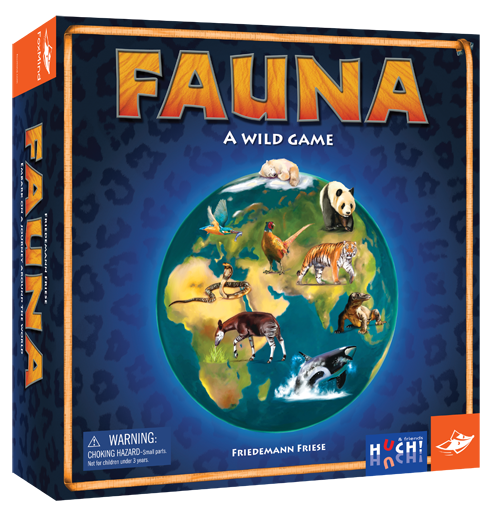 Fauna has been quite well-received but suffered from a bit of a translation issue (who wants to play a trivia game in a language they don't know?) The great news is that FoxMind, a Canadian game company based out of Montreal, is bringing the English version to us. Looking forward to it.